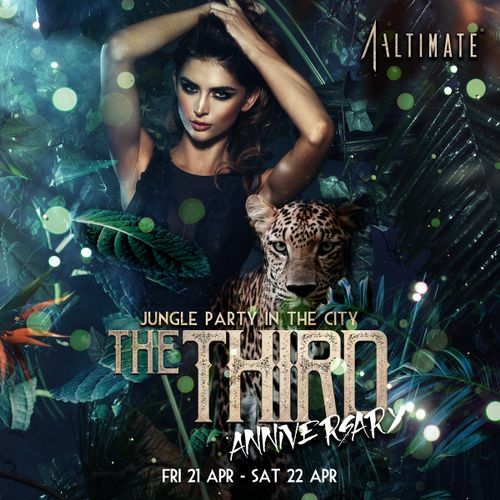 Celebrate in sky-high style with Altimate for its third anniversary with a Jungle Party in the city! Rejoice in Altimate's Urban Jungle for a roaring third birthday party in high-octane style, at the top of the world. Altimate’s doors open from 10:00pm onwards to a jungle world, with a showcase of the club’s state-of-the-art and high-tech visuals. Put your hands up to pumping beats as some of the best spinners in the local music industry get behind the decks, while a specially crafted Jungle Cocktail will be served through the night. Over the anniversary weekend, an incredible display of DJs will be performing on the anniversary night including resident DJ Rattle and local favourites, AOS Collective DJs Andrew T, Killergab and Shai. Hailing from the Netherlands is producer-and DJ duo Tom & Jame, who continue to grow amongst fans with their steady act of EDM music, performing on the second day of the celebrations.